On a blazing afternoon at a labour chowk in Delhi, we meet Phool Singh. 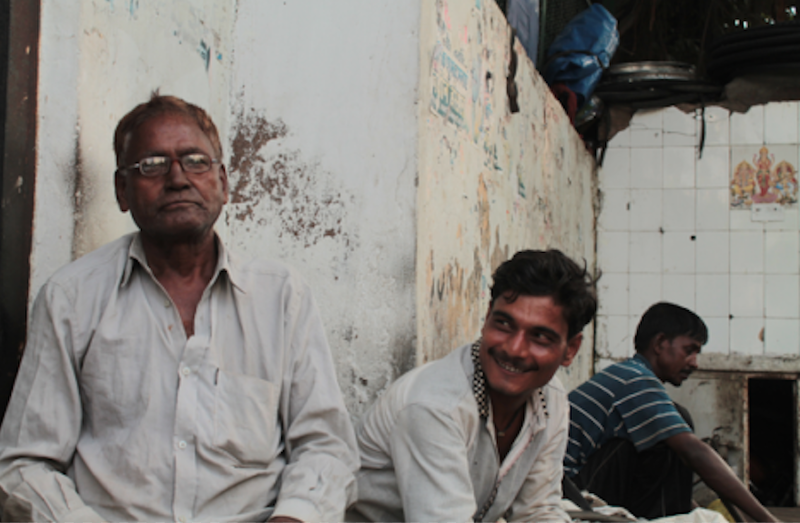 He is the senior most worker at one of these informal labour markets found across the city. Now 60, he arrived in Delhi from Uttar Pradesh 36 years ago with his wife and two daughters. He quickly rented accommodations and settled his family. Within two days, he was at a labour chowk, often the first port of call for migrants seeking work in a city, he reports. In the 36 years that have intervened since he has continually gained skills through on the job learning. He started as a casual labourer, then became a painter, a mason, and finally a carpenter. Yet, after these many years, he still cannot be sure to find work every day. He is as exposed to the vagaries of the informal labour market as the group of young workers who gather around him. Most are migrants and live on the margins of poverty, earning less than the government-set minimum wage, but just enough to manage food, clothing, and shelter. Their reason for moving away from home can be summarized by what one young worker says about migrating to Delhi, “Jahan mile chaar, wahan dera daal” (Build your home wherever you get work). Phool Singh’s story is characteristic of many workers in India in that he migrated from a village to a city, has no formal training, and works in the informal sector. Labour chowks exist across Indian cities. CSK Singh shows their existence in Delhi, Salem and Vellore. In 2002, in a census of labour chowks in Delhi, it was found that 99 such chowks exist. Some workers at the Singal Pur labour chowk report that these chowks exist every 5-6 kilometers in Delhi, each hosting 400-500 workers depending on work opportunities in surrounding areas. Workers at labour chowks are employed for short-term projects like household repairs and renovation. A survey of labour chowks in Navi Mumbai found considerable incidence of contract enforcement problems. Migrant workers belonging to linguistic and caste minorities were often denied complete wages. With no social networks or enforced policies to support them these migrant groups are marginalized at labour chowks. They often do not have access to services such as extended health care, pension plans, sick or parental leave, or benefits. Since informal labourers are often forced into this type of employment out of necessity they can become vulnerable to exploitation, having minimal bargaining power when it comes to negotiating their wages. The dynamics between workers and potential employers reveal several immediate points for redress. First, information asymmetry exists in the hiring process. When employers come to hire workers they have no way to verify their skill level. This makes it difficult to differentiate between high and low skilled workers and has an impact on wages. The employer would, as a result, pay a wage lower than what a high-skilled worker deserves. This sub-optimal wage may also drive out high-skilled workers from the chowk and leave only unskilled ones. Second, workers must wait at the labour chowk for employment opportunities to come their way. This wait extends from many hours to several days in some cases. While workers want to improve their skills in order to earn higher wages, they simply cannot. The opportunity cost for individuals to enroll in skill-training courses at off-site centers that can last a few months is extremely high. They are in a catch-22 situation, where to boost their income, they have to leave the labour chowk but they cannot do so without the loss of the daily income that supports their families. 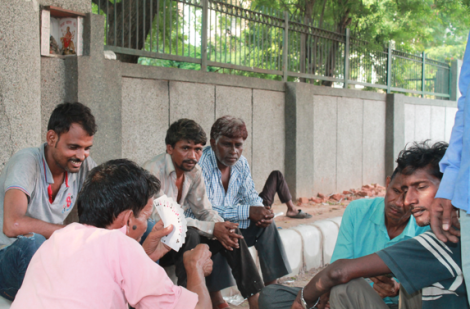 Third, according to research by Srivastava and Sutradhar a large number of informal sector workers do not avail themselves of social security benefits that are available to them because of a lack of awareness. The informal labour market employs 91.2% of the workers in India. Construction is the second largest employer after agriculture. Concern for these workers has led to the enactment of various social welfare regulations. For example, the Unorganised Workers’ Social Security Act, 2008 provides several social security benefits to workers in the unorganised sector. These include i) life and disability cover; ii) health and maternity benefits; iii) old age protection iv) benefits related to housing, education of children, skill upgrading, and funeral assistance. Moreover, under the Building and Other Construction Workers’ (Regulation of Employment and Conditions of Service) Act, 1996 and the Building and Other Construction Workers’ Welfare Cess, Act, 1996 state governments are required to register construction workers, provide them with identity cards, set up worker welfare boards, and register beneficiaries under a state-level welfare fund. However, these laws and regulations are often not implemented, and fund utilisation by welfare boards remains low. In 2013, the average utilisation of funds under the state welfare boards was only 15 per cent. This number only improved marginally to 21 per cent by 2015. Further, failing in their primary task, state welfare boards have been able to register only 22 million out of the 50 million workers in the construction sector. This leaves millions within the construction sector without appropriate government benefits and labour protection. While these issues can be identified in many labour markets, workers in the informal construction sector are socially and economically marginalized in particular. This context requires specific policy interventions instead of broad policies that aspire to be the panacea to all problems. For instance, Skill India, though novel in its intention, does not account for the fact that construction workers in India cannot afford to engage in months of training without pay. Many initiatives may positively impact the labour conditions and job security of those at informal labout chowks. The following three interrelated ideas could directly impact the issues these workers face. First, bringing training to workers through mobile learning centres that cater to different labour chowks across the city will enable workers to undergo short-term skill training courses on site, without having to lose work opportunities. The learning material could be based upon the national curriculum developed by National Skill Development. Skill training could be reshaped into short one or two week modules with the appropriate flexibility to accommodate learners at the labour chowks. Second, as individuals progress through modules certification of their skills can be stored in an Aadhaar linked digital repository. This will allow employers to gauge the skill level of workers and pay them better wages. Eventually, a skill-differentiated labour market at the chowks would reduce information asymmetries and improve the bargaining power of workers. Third, since most residents in India have an Aadhaar number, labour welfare boards should register workers with their Aadhaar numbers to improve access to welfare schemes. These mobile learning centres can become key points of contact for creating awareness and assisting workers in accessing these benefits. Although no activity is free from possible pitfalls, these approaches could be part of bringing innovative solutions to multifaceted employment issues. Not only does it leverage people’s unused time to provide quality training and upskilling opportunities, but it links them to existing social schemes and fosters agency in the informal marketplace. It does this by utilising technology and training opportunities in a way that is adapted to the reality of those at the labour chowks. The mobile learning units redesign the traditional way of channelling governmental benefits and training. Use of the aadhaar system capitalises on a valuable opportunity to validate the accomplishments of learners. Written by Prateek Sibal. Based on a project proposal developed by Farah Kashaf, Pietro Desideri, Sarah Froese, and Prateek Sibal for the 2017 Geneva Challenge. Sarah Froese and Farah Kashaf are pursuing Masters in Public Policy and Global Affairs at the University of British Columbia, Canada. Pietro Desideri and Prateek Sibal are pursuing Masters in Public Policy at Sciences Po, Paris. Newer PostWhen Did We Stop Forgetting About Resiliency?